Holiday Gift Idea: Hawaiian Wearable Art in Makaha! 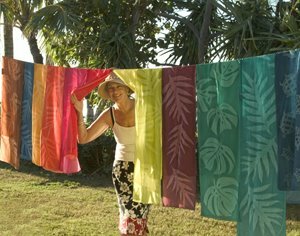 Hawaiian Wearable Art: a collection of Hawaiian shirts, Hawaiian clothing and tropical home decor inspired by an elegant Hawaiian print fabric hand-dyed by Vicky Durand at her Makaha Beach studio. Each of Vicky’s Hawaiian clothing creations is crafted from vibrant Hawaiian print fabric promising one-of-a-kind tropical clothing that includes gorgeous Hawaiian shirts, the Hawaiian print dress, sarongs and pareo. 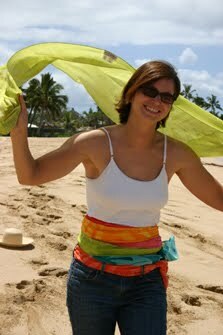 Hawaiian Wearable Art also offers scarves, visors and other tropical accessories for resort wear. The Hawaiian Wearable Art collection of tropical home decor embraces the same Hawaiian print fabric for stunning home accessories such as table linens, table runners, napkins…even unique shower curtains made from their tropical fabric for Hawaiian decor.